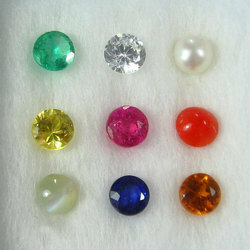 Pioneers in the industry, we offer navgraha stones, pure navratna stones and navratna stones from India. Navaratna Jewelry is getting more and more famous because of its Stylish looks and astrological benefits. 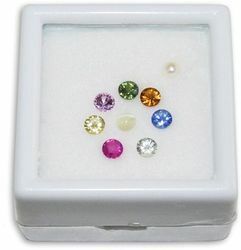 When wearing astrological remedies either one can wear Gemstone Jewelry based their zodiac or horoscope or wear a Navaratna or Navagraha Jewelry which has all the 9 stones representing the all 9 planets. 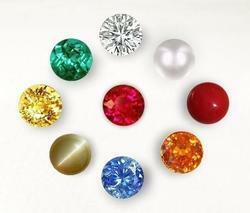 Navaratna refers to the nine gemstones related to the nine planets used in Vedic astrology. The word nava means ‘nine’ and ratna means ‘gem’ in the Sanskrit language. Navaratnas are considered auspicious and believed to give the wearer Good Health, Prosperity, Happiness and Peace of Mind. It wards off negative energies or malefic effects of Planets and strengthens the positive influences of the gems.